Zionist Union chairman, opposition leader hold joint press conference following Liberman's resignation. 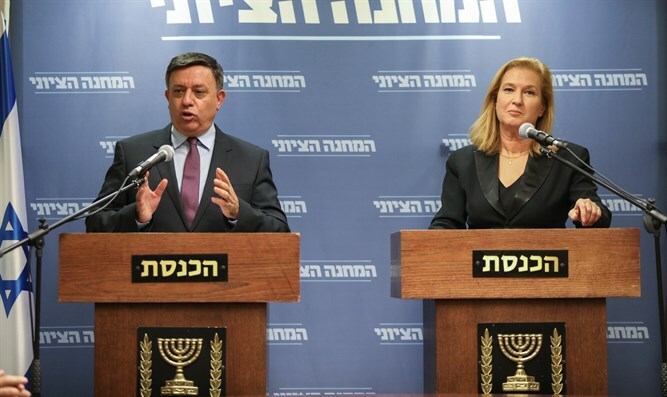 Zionist Union chairman Avi Gabbay and opposition leader MK Tzipi Livni on Wednesday evening held a joint press conference following the resignation of Defense Minister Avigdor Liberman. Gabbay, who was originally aligned with the Kulanu party and resigned from his post as Environment Protection Minister when Liberman was appointed Defense Minister, called for early elections. Livni, too, called for early elections and said, "The time has come to bring a better government to Israel, and all the statements made here by the chairman of the Zionist Union are true. The time has come for democratic elections and the sooner the better. The state cannot be left in their hands." "I think this is an important day, a day of hope, a day when we begin to see the government disintegrate from the inside. Liberman opened the door, now everyone has to exit through it, go to elections and allow us to run the country once again. To provide security, to restore hope for peace, to return our country to its people,” she added. Livni also added that Liberman "revealed what we already knew for a long time - this government is feeble in the face of terror, it abandoned the residents of the south and if there is anything more important to say today, it’s that you need more than empty slogans for defense." In announcing his resignation earlier on Wednesday, Liberman cited several differences with Prime Minister Binyamin Netanyahu as the reason, including a ceasefire deal between Israel and Hamas which was reached on Tuesday. He also mentioned the recent coalition decision, pushed by Netanyahu, to delay implementation of a Supreme Court order to demolish the illegal Bedouin encampment of Khan al-Ahmar east of Jerusalem. Meanwhile, even after Liberman’s announcement, the Zionist Union again failed to gain traction. A poll released on Wednesday and conducted after Liberman’s move found that, if elections were held today, the Zionist Union would win 11 Knesset seats. A poll released at the end of October gave the Zionist Union 12 seats.